In Tribute To Yorkie Val. As many of you know, here on Grows On You, we recently lost a valued member of our Goy Family, when Val, better known as Yorkshire, passed unexpectedly recently, leaving many of us shocked and in tears. Val was well known and well loved among many of the loyal GOY members, for her love of gardening, and that incredibly zany humour of hers that kept so many of us here in stitches. She could find humour in anything and everything, and humour is such a wonderful shared gift by us all. Somehow, our friend could just reach out across the miles and come into our homes and make us laugh, and we responded in our droves. That is the power of the internet, no matter how isolated you may feel, friendship can be just a click away. Val and I became good friends thanks to this lovely Gardening site, and shared many a chat through our pm’s and emails and plus of course her endless collection of risqué jokes, but mostly Val lived for the camaraderie she shared with us all on her blogs or photos she posted here online. Who can forget the ‘Moonies’, who then became the ‘Moonsisters’ here on Goy that received numerous comments that went into the hundreds? We have giggled endlessly and unashamedly, shared her ups and downs, and enjoyed the photos she posted of her lovely garden…the one common link that makes us all a family here on GOY, that passion we keep in our hearts of the love of gardening, but also friendships gained. This is what makes Grows On You, the huge success it is, and unites us from all four corners of the world. Val played a major part in that, and will be much missed by all of us fortunate enough to have shared just a little part of her life and friendship on here. Pita, Val’s daughter is also a valued member on GOY, apart from being an exceptionally talented photographer, she shares her mother’s love of humour. Pita has recently shared a poem ‘The Dash’ written by Linda Ellis, that had been read at her mother’s funeral, with us all and I have been in contact with her to ask if I could also share my own personal tribute to Val in a poem I have written especially for her. Pita happily agreed to my request, so in tribute to a much loved and much missed dear friend, here are a few of my own humble words that I hope incorporate the feelings of us all here on GOY lucky enough to have known her.. Thank you for reading my friends..
leaving loved ones so bereft.. The friends you made both near and far..
know how special, Val, you are. So much laughter, so many jokes..
Remembering witty blogs we wrote..
and kept us giggling fit to bust! though in our hearts, you’re always near. No one can extinguish your brilliant flame..
as in our thoughts you will remain. dear friend you helped create on Goy. This poem is just my humble touch..
to someone we all still miss so much.. In tribute to you, Wife, Mother, and Pal..
Keep them laughing in heaven, our Yorkshire Val’. With grateful thanks to Pita for letting me share this with you all, Ralph and all the family..We keep you all in our thoughts my friends..always. Previous post: The Demise And Resurrection Of A Cordyline Australis..
Next post: An Unexpected Gift..
Hello Pam.. I hope that Yorkie would have approved..She was such a lovely friend, and I will so miss the laughs we shared.. I wonder if our friends here on Goy, realise just how much they touch us and leave a mark even though we may never meet in person..? I know that other demands on my time have kept me busy and away from Goy this last year or so, but not one of my friends I have made on here over the years has ever been forgotten and Val will always remain a part of us even though she has passed..
Hello Janey! Oh what a lovely surprise to see you my friend! I checked that Pita approved before I published this poem, but thought it really was a fitting tribute to a much loved Goy member..
"Earth Angels" they do walk amongst us and many of us are blessed to have known them in whatever form that takes and it seems that your dear friend was indeed an Earth Angel. I too sadly didn't get to know Yorkshire Val and am very sorry that I didn't ! My sympathy to all her friends and family. That was a beautiful poem Flori. Beehappy, that was an absolutely gorgeous comment you made, and I have to agree with you about Earth Angels, there are quite a few on here.. I am deeply touched by your lovely post. Val had the most outrageous sense of humour, and was such a lovely warm vibrant soul that she has left a huge gap in our Goy family..
a very fitting tribute Floribunda. Glad Pita approved. It is lovely. Thank you Sbg..I made sure that Pita thought this poem was suitable to share among all Yorkie's friends on Goy and she readily gave me her support..
Wow,, another tear jerking wonderful blog and comments. Flori, you are an amazingly talented and wonderful being and your sentiment is truly heart touching. Thank you so very, very much for your love and kindness. Thank you also to all GOY friends, beautiful tributes and kind words. Such a wonderful tribute to dear Val (Yorkshire), Flori. I know that Val loved her garden so very much. Like yourself, I haven't been on here for sometime, but I do look in from time to time just to see what is happening here. Val was one of my friends on GOY too and I am sure that she would have appreciated the kind words that you have said on here. My thoughts are with Val's family and friends, including all the friends here....take care everyone, and hope all your flowers and plants bloom well in 2014..
Hi Pita..Loved the thought of your mum being more like a Hell's Angel and Rebel without a cause too, than just an Earth Angel lol.. I certainly know she could even make me blush from some of the jokes she would pass on to me..but I loved receiving each and every one because they were so Val..
Am so delighted that you liked this blog about your mum..that was important to me my friend. The one thing we all wish for in this world before we shake off our mortal coil is that we have touched someone and made a difference.. Your mum reached out and touched a lot of us through Goy and she did make a difference. and she will always be fondly remembered for that and so much more.. I hope you feel that I've done her proud. Ah Richard, you snuck in here just as I was posting this reply to Pita..Great to see you too old friend..Thank you for posting such a great comment..Val touched so many of us on here. Although I love Goy for all the great gardening inspiration, it is the laughter and friendship that I always reflect on most.. I hope to be on Goy a little more now that I am not quite so committed to other projects, as I certainly miss you all and the camaraderie we all shared in days gone by. Our lovely Yorkie will be much missed but never forgotten..This loving tribute was the least I could do for someone we all cared so much for. That's very thoughtful of you to add this blog to GoY .. Although I haven't been on here so much because of other demands, I do look in now and again, and Pamg keeps me updated too. Was such an awful shock to hear about Val..
We shared a lot of really good laughs together, and I wanted to pay my own tribute to a much loved member of Goy..
Hope all is well with you my friend..Lovely to see you here..
Hi Flori..a lovely tribute to Val,it was so nice to compose this in her memory..and I know Pita and Ralph love it too..
Hi Bloomer.. I know you and Val were good friends on Goy, so I know your loss is deep indeed, but I'm so pleased that you liked this humble tribute to Yorkie.. She made a lot of people laugh, and in return, she was much loved by so many. It was a terrible shock, I knew, from her pm's she was in a lot of pain and couldn't walk far, we joked about her whizzing off on a mobility scooter, but had no real idea of the seriousness of her illness. ....oh,that one,Pam! I don't think he is in our thoughts anymore,and is now barred !.We need to find a suitable replacement..pronto..maybe to be continued on the original blog,at some point? Just wonderful Flori ... I miss Yorkshire's banter about the North/South divide in the weather ... when I posted a photo of the first Daffodil out in my garden she said she'd thrown her toys out of the pram as she just had the green tips of Daffodil leaves showing in her garden! Always a pleasure to receive a comment from her ... she will be missed by so many on GoY. So lovely to see all these comments posted about our lovely Val. So many good memories that no one can take away from us all, and so much laughter.. Goy has always managed to make me cry in merriment, 'specially at some of the crazy posts added. I must have missed the great love triangle BA, poor Johnjoe wouldn't have know what hit him! lol It was the humour we found in the darkest of days at times, that kept our Goy 'family' together..We always knew we could rely on our friends on here to make us laugh and get us through whatever ailed us. Yes Pam, I remember poor Santan getting stuck up the chimney and her firemen..lol Poor Richard peej became a cross-dresser according to us, and Ba and I became strippers (of wallpaper I hasten to add!) lol Crazy wonderful fun.. Our 'Moonies' weren't a lot better either if I recall rightly. Shirley, thanks for looking in..I think nearly all of us who fondly remember Val on here have such great memories of her, usually always because of that wacky sense of humour..
What a beautiful tribute to Yorkshire/Val you have done her proud Flori as only you could. Hi Dd! Always good to see you my friend. Thank you so much for popping in to add a comment. Glad you feel that I have done Val proud with this tribute..I think I am only saying the words that so many of us feel about the loss of such a lovely valued member of Goy.. Yes, now my project is completed, I hope to be back on Goy on a more regular basis now. I have certainly missed you all! Glad to say that we are both fine as is Raffie..I hope that life is treating you and yours well too..
Oh well done Flori for that lovely poem. You put into words what we all would love to say about Val. I am so missing her too.... I am sure it is appreciated by us all. Lovely poem for a lovely lady, will miss her on here. Bless you for looking in on me Cinders..I had hoped this poem would convey how we all felt losing such a good friend from Goy, so I am so glad you feel I have succeeded. Lovely to see you Karen, and only recently realised that you had moved! Hope all is going well my friend. I'm so glad to see so many old friends on here who have united us through Val. She would be tickled pink! Val just reached out and touched so many people here on Goy. I think being direct can be oddly refreshing..
Flori bless you for bringing so many GOY ERS on to this page. Keep smiling and even though its a rainy weekend - make sure you're sunny inside! It is so great to see so many dear friends popping into this page, it warms my heart it really does..
Hello Pam..I swear that friendships on Goy can be the best in the world.. I feel as if I have been lost, and now found myself back home once more among the ones I care for most. Val still working her lovely magic keeping us all together and uniting us once more here on Goy.. Sorry to see that Val is with us no more, may she look down on us all, R.I.P Val, I repeat what all have said about the poem that you wrote it is a very fitting tribute Flori. Bless you John, that is really a lovely comment to post. Val will never be forgotten that is for sure..She has left her mark on all she touched on here at Goy and in her life. Floribunda. what lovely tribute to Val, she really was a great friend to have. Full of humour always straight to the point, her comments would be funny and witty she sure was a friend in deed. Every time I upload a photo I do expect a comment from Val, it did not matter how bad the photo was, she would always have something nice to say about it. Yes I do feel she is looking down on us and pointing at us silly billys, lol, out to all the other souls. I do light a candle and say a prayer for her and her husband Ralph and Family. Oh Johnjoe, what a pleasure to find you here on my page, and yes, Val is so deeply missed by so many of us on here. 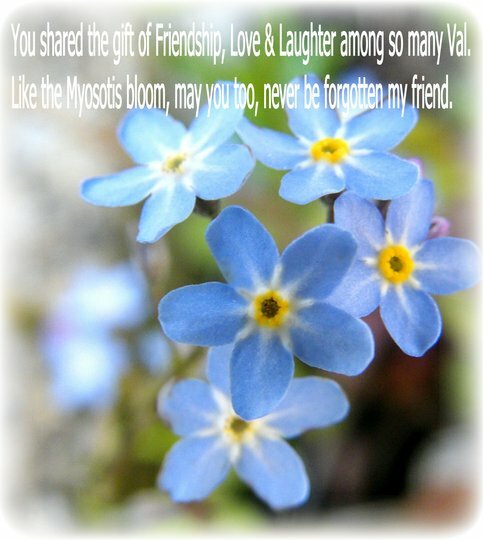 It is amazing how so many of us may never meet but the warmest of friendships are created through the internet and GOY in particular..
How lovely of you to write that poem as a fitting tribute to Val, Flori. I can't say I 'knew' her well but she obviously made a huge contribution to GOY and brought laughter into people's lives - and we're always the better for that. Nice to see you here, Pita - hope you're doing ok.
A Courtyard Garden on a Budget..